This bulletin board was initially made in preparation for our postcard exchange program my class participated in. I had found the postcard exchange participants through the ProTeacher Busyboard. My students each made two postcards and we sent out one to each of the fifty states. Then, we waited anxiously for our postcards from the other states to come to us. 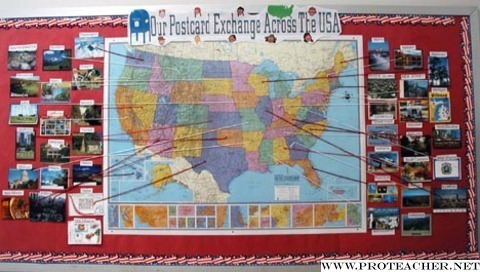 When receiving the postcards the students would read their chosen state's message on the card to the class, label it form Appleworks on the class computer and attach it on the bulletin board with a string highlighting the state to the USA map in the center of the bulletin board. Many classes in our building have looked at our board and anxiously awaited all our cards along with us!